Winmate Handheld devices address a very specific need which is providing a rugged, reliable Barcode or RFID reader for warehouse and logistic application. The advent of Radio Frequency Identification (RFID) or Barcode technology has created benefits for warehouse and logistic. These technologies allow users to trace their product items across the supply chain and it will make their supply chains become effective, efficient and reduce errors. As a company which always aims to fulfill the customers’ need, Winmate proudly presented the new E430M2 which is faster and more powerful than the predecessor model. A 1GHz dual-core Cortex A9 processor replaces the 650MHz ARM 11 found in the original version. • Android 4.1 "Jelly Bean"
RAM memory has doubled to 1GB SDRAM and storage has doubled as well; users now get 4GB eMMC. Onboard WiFi has been upgraded to 802.11 a/b/g/n for maximum wireless voice/data speed and flexibility. Most importantly, the new E430M2 is based on Android 4.1 ("Jelly Bean"), which offers full dual-core support as well as numerous technical and user interface improvements over Android 2.3.4 ("Ginger Bread") used in the older version. As in prior versions, the E430M2 provides a modern look and feel with state-of-the-art handheld device technology in a tough and rugged device. Building on the overall design of the E430 series, this new model remains completely compatible with all prior peripherals, including barcode or RFID readers (available are a 2D barcode reader, 1D laser, as well as HF RFID). The device includes a 2-megapixel front camera and a 5-megapixel rear documentation camera with illumination LED. 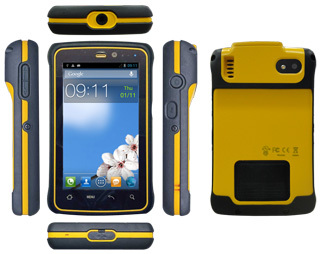 On the ruggedness side, all Winmate Handheld Series devices are designed to be used in harsh environments. The E430M2 offers IP67 sealing (standard model, w/o sensors), a 5-foot drop specification, and a -30 to 60 degree Celsius operating temperature range to allow the device to be used in any harsh environment.